In this post here, I talked about how I play the national lottery, place a bet on one horse-race a year and occasionally gambled on football matches. Gambling like this is a hobby of mine, under control, although I don’t really know exactly how much I spend on this past-time. All I know is that I don’t spend as much on the lottery as I used to years ago. So I dug out my bank statements for 2013 to do an analysis on my gambling habits. Last year, I gambled away over £522! By gambling, I mean lottery, online betting on football matches, football pools, fantasy football and football predictions. I say ‘over’ £522 because it’s not possible to measure the exact figure, as I’ve only gone by what has been tracked on my bank statements and of course, these don’t include any cash bets I may have placed (and I have done). This means the figure is likely to be a lot higher. So much for being in control! 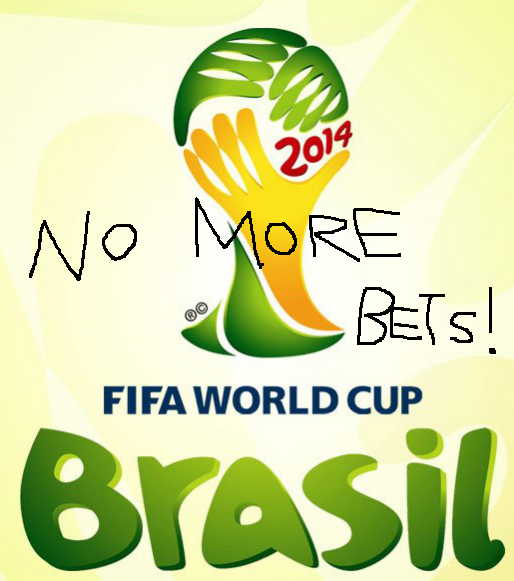 The football pools was cancelled late last year and I have resolved not to add any more funds to my online betting account for the rest of this year – no, not even for the World Cup! I have been placing bets, but I’m just using the funds left in the account. My lottery syndicates will be down to £104 and ‘other lottery’ will be down to £30 (100 Club lottery which is a fund raiser for a society I’m a member of). So I can reduce my gambling by 60%, meaning that over a year, I should have an extra £300 to save/invest, instead of throwing it away! Good luck with reducing your gambling – I bet you won't even miss it. It is always a shock when you add up how much those "little extras" come to over time. I'm a sucker for glossy magazines which I only half read and then throw away. I'm trying to wean myself off them as buying so many is a complete waste of money. I would suggest going one step further and closing your online betting account. The thing with gambling is that the odds are in favour of the bookmaker every time. The longer you keep playing the more you'll lose. Why not take the money from that online account and invest it somewhere where the odds will be in your favour? Thanks – actually, I do miss it already but my willpower's strong so I'm not going to succumb so easiliy! I know what you mean about the glossy mags – I too used to spend a lot of money on them. These days, I only buy them when I'm travelling for something quick to read and throw away, otherwise, I don't bother any more. You're right – I should close it but I won't,simply because gambling is a hobby of mine. I know now exactly how much I will be gambling and that will be in moderation, an amount I can control. Yes, the odds are always in favour of the bookmaker but part of the fun is trying to beat those odds! I'll review in 12 months time in any case. Thanks for stopping by. Wow, its amazing how all those little spends really add up! I think if you enjoy it and know your limits then a bit of gambling is fine. Its probably a good idea to keep a track of how much it does cost you then you will be able to spot if your spending on gambling is increasing too much. Yes, it was quite shocking how much it all added up but as you say, I now know my limits and am confident that I will have the willpower to not spend too much on this past-time!